Mercury, the closest object to the Sun, is a small, bleak planet. Because of the Sun's intense glare, it is difficult to observe Mercury from Earth. Mercury is visible just above the horizon for only about one hour before sunrise and one hour after sunset. Mercury is named for the Roman messenger god with winged sandals. The planet was so named because it orbits the Sun quickly, in just 88 days. In contrast to its short year, Mercury has an extremely long day. It takes the planet the equivalent of 59 Earth days to complete one rotation. Mercury is the second smallest planet in the solar system (only Pluto is smaller). Mercury's diameter is about 3,000 miles (4,800 kilometers), yet it has just 5.5 percent of Earth's mass. (Earth's diameter is about 7,900 miles [12,720 kilometers].) On average, Mercury is 36 million miles (58 million kilometers) from the Sun. The Sun's intense gravitational field tilts Mercury's orbit and stretches it into a long ellipse (oval). 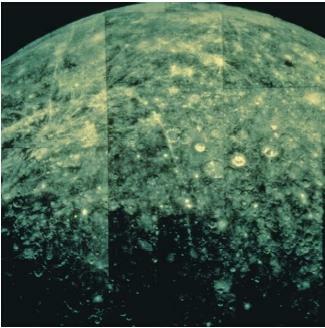 Little else was known about Mercury until the U.S. space probe Mariner 10 photographed the planet in 1975. Mariner first approached the planet Venus in February 1974, then used that planet's gravitational field to send it around like a slingshot in the direction of Mercury. The second leg of the journey to Mercury took seven weeks. On its first flight past Mercury, Mariner 10 came within 470 miles (756 kilometers) of the planet and photographed about 40 percent of its surface. The probe then went into orbit around the Sun and flew past Mercury twice more in the next year before running out of fuel. 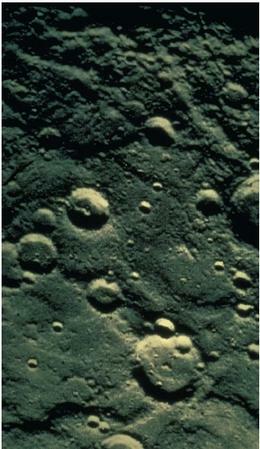 Mariner 10 collected much valuable information about Mercury. It found that the planet's surface is covered with deep craters, separated by plains and huge banks of cliffs. Mercury's most notable feature is an ancient crater called the Caloris Basin, about the size of the state of Texas. however, broke through the cooling crust, causing lava to flow up to the surface and cover older craters, forming the plains. Mercury's very thin atmosphere is made of sodium, potassium, helium, and hydrogen. Temperatures on Mercury reach 800°F (427°C) during its long day and −278°F (−173°C) during its long night. This temperature variation, the largest experienced by any planet in the solar system, is due to the fact that Mercury has essentially no insulating atmosphere to transport the Sun's heat from the day side to the night side. Mariner 10 also gathered information about Mercury's core, which is nearly solid metal and is composed primarily of iron and nickel. This core, the densest of any in the solar system, accounts for about four-fifths of Mercury's diameter. It may also be responsible for creating the magnetic field that protects Mercury from the Sun's harsh particle wind. Perhaps one of the most surprising discoveries in recent times was that of ice at Mercury's poles. The finding was made in 1991 when scientists bounced powerful radar signals off the planet's surface. Scientists had previously believed that any form of water on Mercury would rapidly evaporate given the planet's high daytime temperatures. The polar regions of Mercury are never fully illuminated by the Sun, and it appears that ice managed to collect in the permanently shadowed regions of many polar crater rims. It is not clear where the ice came from, but scientists believe comet crashes may be one source. In 2004, the National Aeronautics and Space Administration (NASA) plans to launch the $286 million MESSENGER (Mercury Surface, Space Environment, Geochemistry, and Ranging) spacecraft. It will reach Mercury five years later, enter orbit, then examine the planet's atmosphere and entire surface for one Earth year with a suite of detectors including cameras, spectrometers, and a magnetometer. MESSENGER will also explore Mercury's atmosphere and determine the size of the planet's core and how much of it is solid. Finally, the spacecraft will try to confirm whether water ice exists in polar craters on Mercury. The European Space Agency also has ambitious plans to explore Mercury. At some future date, it proposes to send a trio of spacecraft called BepiColombo that, like MESSENGER, will study the planet's atmosphere and search for water ice in polar craters. BepiColombo will include two satellites and a vehicle that will land on the surface, deploying a tiny, tethered rover to gather information. is there water on mercury?? what is so specvial about mercury? ?